A couple years late perhaps, but another Sarna editor just found a reference to the Mule-II DropShip class (in a LinkNet 3136 article, p. 119). What do we know about this class? Is it mentioned anywhere else? All for it, but no idea- improvements have been theorized for a while . . . 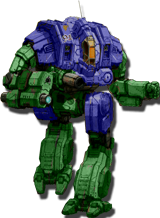 I want to say MWDA fiction talked about a cargo mech having a space for cargomechs to be parked in . . . but no idea what dropper it was supposed to be in that bit. In the absence of other information, it is indeed likely that the "II" part has something to do with the ship being "recently renovated", as in somehow upgraded. If it was meant to be a new class it didn't get entered into the MUL yet. MWDA liked to sneak in stuff like that. There's also a Magellan MkII JumpShip mentioned in a single image caption. TPTB (Ray) ruled that one as not being a proper class of its own, so implicitly a variant. I guess the same applies here.